Laser Cutting - A Trumpf 6kw Fibre laser cutter. It has a max sheet size of 3000mm x 1500mm. It is capable of cutting 25mm thick mild steel to an accuracy of 0.05mm. Oxy Cutting - Two oxyfuel gas CNC profile machines. Each has six torch cutting heads enabling multi - part cutting. Processing material up to 100mm in sheet sizes up to 6 x 3 metres. 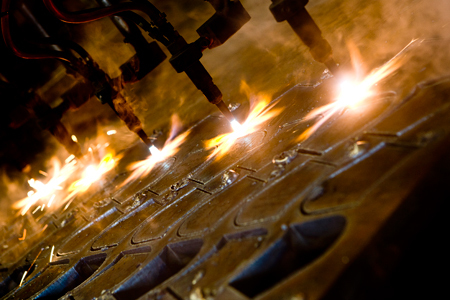 Plasma Cutting - Ecam has invested in the latest HD plasma cutting technology. Having two single head cutting beds capable of processing plate sizes of 6 x 3 metres and 25mm thick. The profile shop is serviced by a Street 5 ton overhead crane that enables very quick change over times. A Gulco Bevelling machine allows for speedy bevelling, eliminating the need to prep at the fabrication stage.